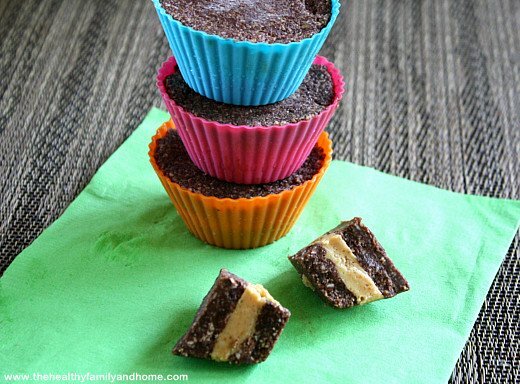 Ok, these little guys are a relative of my Healthy Peanut Butter Cups which I already can’t get enough of. 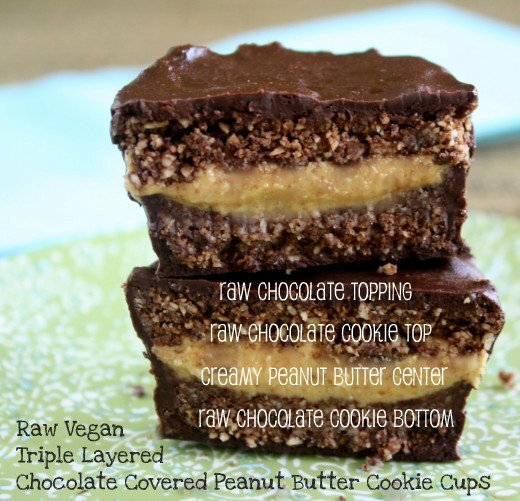 I’ve kicked it up a notch and turned them into Raw Vegan Triple Layered Chocolate Covered Peanut Butter Cookie Cups. 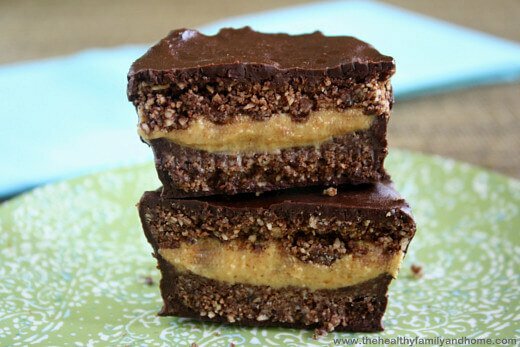 It started with the Healthy Peanut Butter Cups and my love for chocolate and peanut butter. 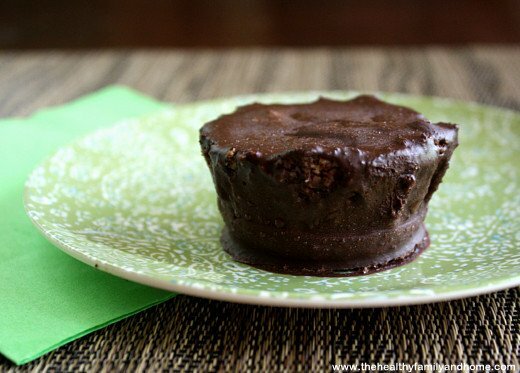 Then I came across an unbelievable recipe on a post from Susan at Rawmazing called “Raw Thin Mint Peppermint Patties”. She had three different recipes in the post and one was “Chocolate Covered Mint “Oreos””. I just couldn’t stop looking at her pictures! The only problem is I’m not a big fan of coconut FLAKES. As strange as it sounds, I drink coconut milk, eat coconut oil, coconut butter, coconut manna (all of which are made from coconut/coconut flakes!) but just do not like the actual flakes. As I stared at the pictures of the Chocolate Covered Mint “Oreos” with the coconut center, I kept thinking of what else could I put in the middle instead. 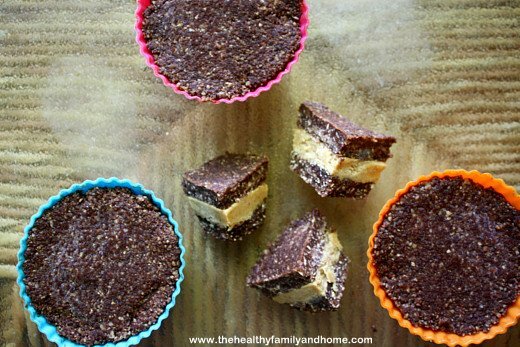 Then the Healthy Peanut Butter Cups came to mind! 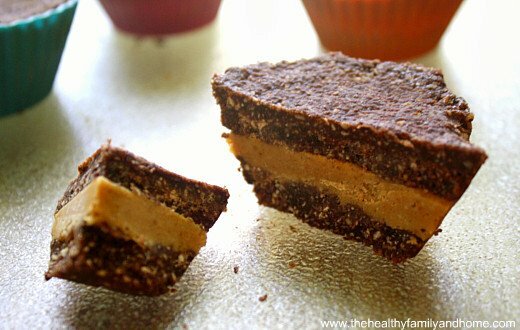 So I used her raw cookie recipe and combined it with my Healthy Peanut Butter Cup recipe to make my new favorite dessert! 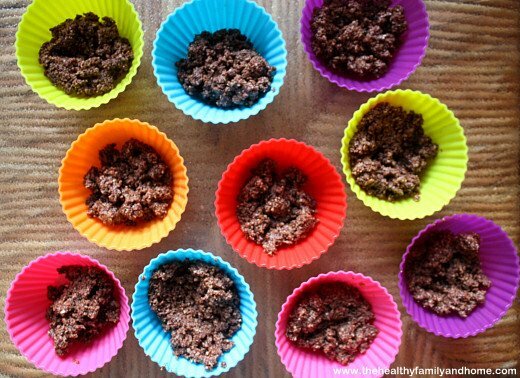 These are good with or without the chocolate topping and either way, only uses 5 healthy ingredients. 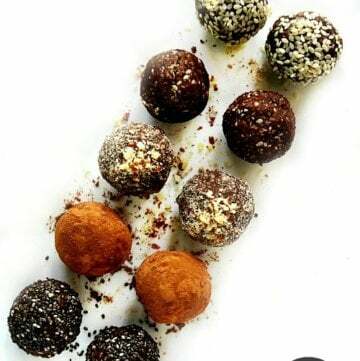 And, another option is to make them without the chocolate coating, which I also love. 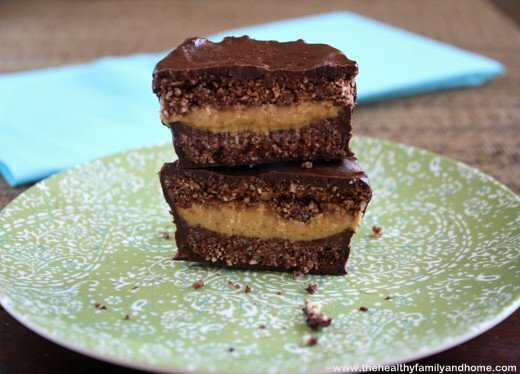 Just make the cookie bottom, peanut butter filling and cookie top. 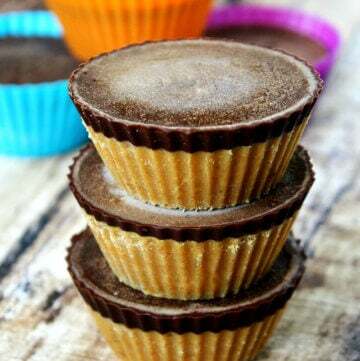 Tip #1: This recipe will make 10 cups and if you use the standard size silicone cups that I used for the Healthy Peanut Butter Cups, these things are HUGE. They are more dense and compact than the peanut butter cups. I set one out at room temperature for about 5 minutes then cut it into 1/4 size pieces and eat a 1/4 piece at a time. Tip #2: They need to be stored in the freezer or refrigerator until you are ready to eat them because they will get soft and lose their shape if they are left out at room temperature. 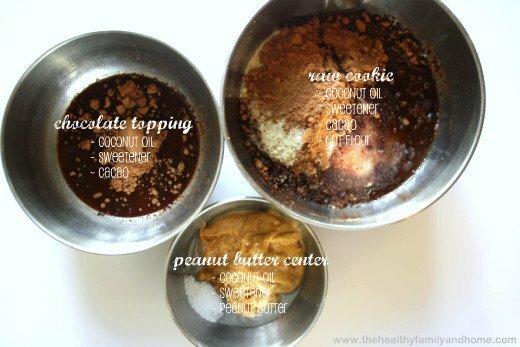 Tip #3: Since you are pretty much using the same ingredients for each step, I line up 3 bowls and scoop all the coconut oil out at one time, then the cacao, then the sweetener, etc. I find this easier than mixing the topping ingredients first, then the center, then the cookie. 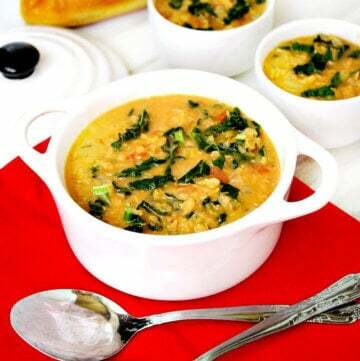 Tip #4: You can pretty much use the sweetener of your choice in this recipe. I’ve used maple syrup, raw honey, xylitol and raw cane sugar on different occasions. You just want something to add a little sweetness. Also, I don’t like a lot of sweetness to mine, so I use the minimum amount shown but if you prefer it to be sweeter, just add another tablespoon until you get it the way you like. Step 1 Put all ingredients into a medium sized bowl and stir together until well combined and you have a crumbly texture. Set aside. Step 2 Put all ingredients into a small sized bowl and stir together until well combined. Set aside. Step 3 Put all ingredients into a small sized bowl and stir together until well combined. 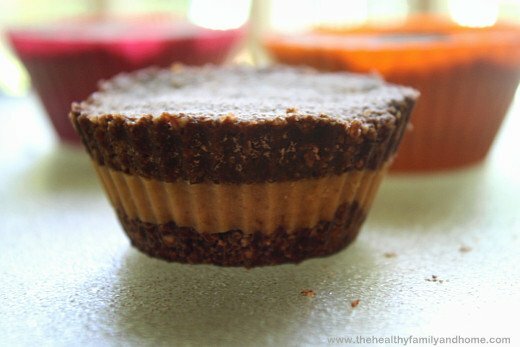 Step 4 Take a tablespoon of the raw cookie mix and put in the bottom of each muffin cup. Press down firmly. Put them in the freezer for 10 - 15 minutes. 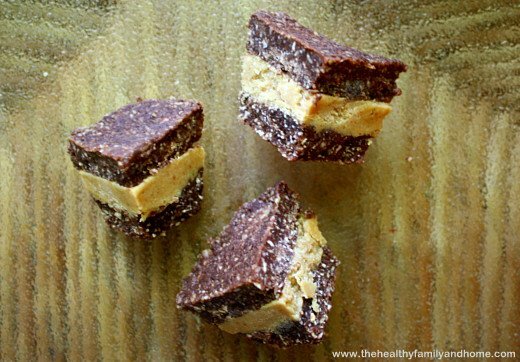 Remove them from the freezer and add about a tablespoon of the peanut butter filling on top of the frozen raw cookie mix. Put them back in the freezer for 10 - 15 minutes. 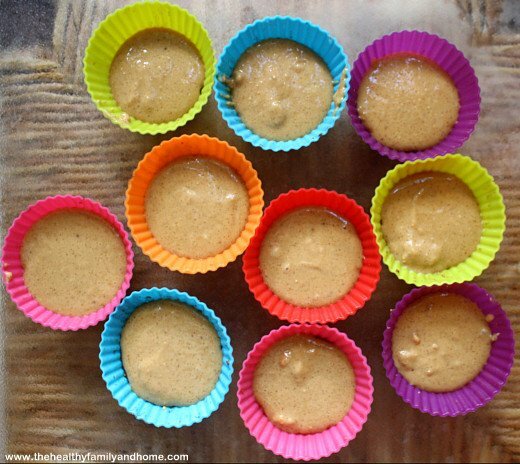 Remove them from the freezer and add another tablespoon of the raw cookie mix on top of the frozen peanut butter mixture. Press down firmly. Put them back in the freezer for 10 - 15 minutes. 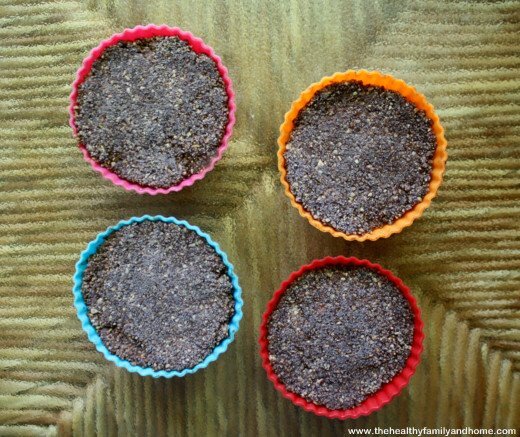 Remove them from the freezer and then remove the frozen layered cookies from the muffin cups. 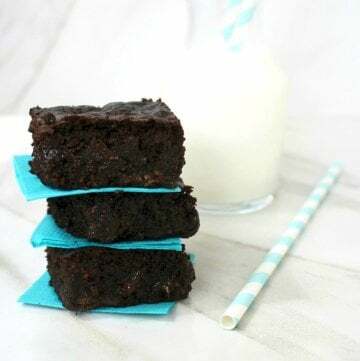 Dip them individually into the chocolate topping mixture, using a spoon to drizzle the chocolate along the sides until they are completely coated. Put them back in the freezer for 10 - 15 minutes. Keep them in the freezer until you are ready to eat them. They will get soft in the refrigerator. 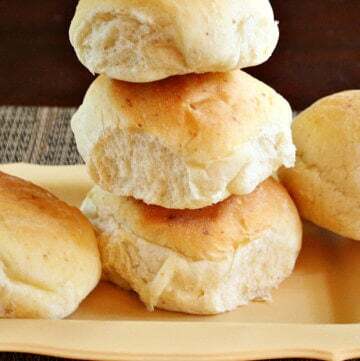 Thaw at room temperature for only about 5 minutes before eating or they will be too soft and start to lose their shape. I just wanted to say that these are DELICIOUS SQUARED! 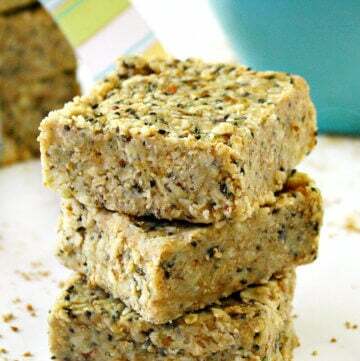 While I did not have almond flour, I was able to get by with some freshly ground oats, and we savored every bite! Incidentally, we have company tonight for supper so I may have an excuse to make them again! On a side note, while we are not “raw vegans” we are all natural, whole-food, and primarily organic vegans (and thankfully free of store bought cosmetics, toiletries, and so forth – save my husbands deodorant…little does he know that when it is gone I am utilizing the container, but replacing it with a homemade product ;p). I love to cook, though perhaps someday we will find ourselves on the raw eating bandwagon, after all my husband and I grew up on the standard American diets, cut out additives (colors, preservatives, etc…) then became vegetarian, then became vegan…and, well, you get the idea. Step by step we have been getting healthier. 🙂 Still, I have NO IDEA how you guys are able to eat entirely raw…can you have rice and beans at all? If so, how? Sorry about all the questions, but I am curious :). Hi Jenna! I’m so glad to hear that you enjoyed them and that the ground oats worked well as a substitute. I had to laugh when I saw your comment about filling the old deodorant container with a homemade one…that sounds like something I would do and something I would ~have~ to do with my husband too lol! My husband and I were just like you, we grew up on the S.A.D. and it was much easier for me to make the change than him. I did the same transitions – vegetarian, vegan, unprocessed then raw. 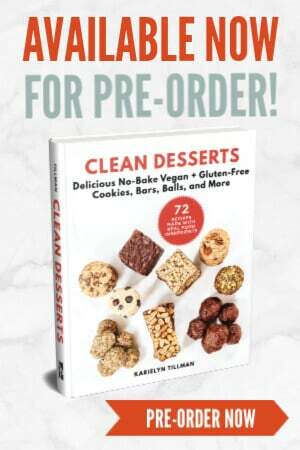 However, I am the only one in my family that strives for a 100% raw diet and when I don’t eat 100% raw, I eat clean, unprocessed, homemade vegan dishes. My daughter grew up with the S.A.D. and has never converted with us. My two boys started out 100% organic and vegan (which is right about when I had my conversion) so they grew up with their crazy mother talking healthy food talk 24/7 lol! The meals I make for them are vegan…pasta, quinoa, rice, etc. But when I eat 100% raw, I don’t eat anything cooked (over 115 degrees)…just juices, smoothies (with homemade milk and raw protein powder), raw superfoods, salads with raw dressings, nuts and seeds and all the raw desserts, snacks, dips, etc I post on my website. Because I’m eating nutritious foods that feed my body, I stay satisfied longer and don’t have cravings like I used to. It’s hard to do, and it’s not for everyone. But just try to incorporate more fruits and veggies, even some fresh juice or smoothies and try replacing a cooked dessert with a raw one (to me, they taste better anyway ;). You’re doing great with how far you’ve come…just leaving the S.A.D. behind is a big accomplishment in itself. Just made these tonight! I used the little mini cupcake cups so they were tiny and cute! My man has already devoured 4 of them. Now I’m going to have to try your other recipes! Do you happen to know the nutrition facts? Cals fat and stuff? That would be awesome! Hi Chelsea! I’m so glad that you enjoyed the recipe! I don’t have the nutrition facts for them but I think you can look it up on MyFitnessPal.com. The reason I don’t list them is since I’ve started eating foods with clean/healthy ingredients and healthy fats, I don’t have to count calories like I used to and am able to lose weight where I never could before when I was eating unhealthy foods. For example, you can have a low calorie/low fat treat, but does it provide any nutrients for your body? And what else is in it? Is it highly processed or does it contain chemicals, preservatives, refined sugar and salt, GMO’s etc? I find when I eat nutrient-dense foods with quality ingredients, I stay satisfied longer and don’t need to eat as much as when I ate foods with empty calories. Anyway, I didn’t mean to go on so long or sound “preachy”, just trying to explain why I don’t focus on calories or provide nutritional data. How many cups of almond flour is it? It looks like there is a typo. Thank you! Hi Sarah! Shoot…you’re right! It should be “2 1/2” cups of almond flour and I just corrected it. These look wonderful! 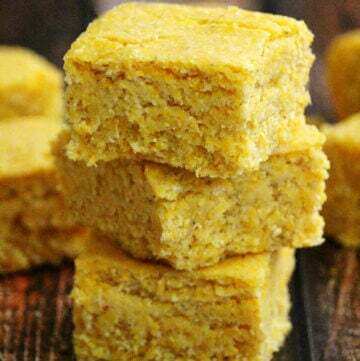 I’m curious if they can be made in a cake pan the cut up into squares. I would like to add them to the dessert/finger food list at a baby shower. I would cut them into small squares and display them on a tray or in mini cupcake wrappers. Hi Michelle! You sure could and what a cute idea! Especially the mini wrappers in one of the cute baby colors. Just follow the same ingredients and preparation instructions and I’d probably use an 8 x 8 glass baking dish for them. But…one thing to keep in mind is that they ~will~ get soft, lose their shape and might get a little messy if left out at room temperature because of the coconut oil that holds everything together. 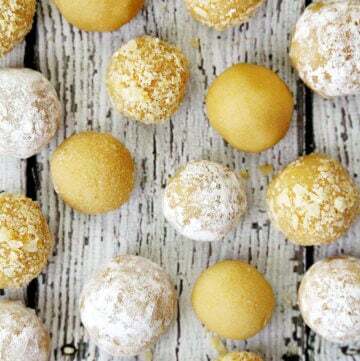 When coconut oil is cold, it stays hard and helps the cookies hold their shape, but once the coconut oil gets to room temperature, it will become liquid and change the texture of the cookies. I would just make sure you pull them out the freezer ~right~ before you want to serve them…and try to think of them as a dessert with ice-cream and serve/handle them the same way (for melting purposes). Haha! Deal 🙂 Your recipes are awesome!! I wish I could have one RIGHT NOW 🙂 With my cup of coffee! 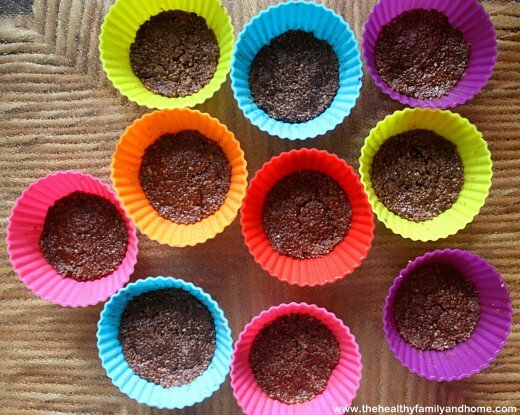 I love all the ingredients — now I just need to get my hands on these little cups you use and I’m ready to go!! Thank you for this recipe and all the others. I so enjoy your posts! I will be making these tonight. Hi Jane! Thanks for your kind comments!